Have you been the feeling the heat as much as we have here in Toronto? It's been incredibly warm and humid these past few days, the kind of temperatures that make you want lighter meals paired with a ice cold drink! 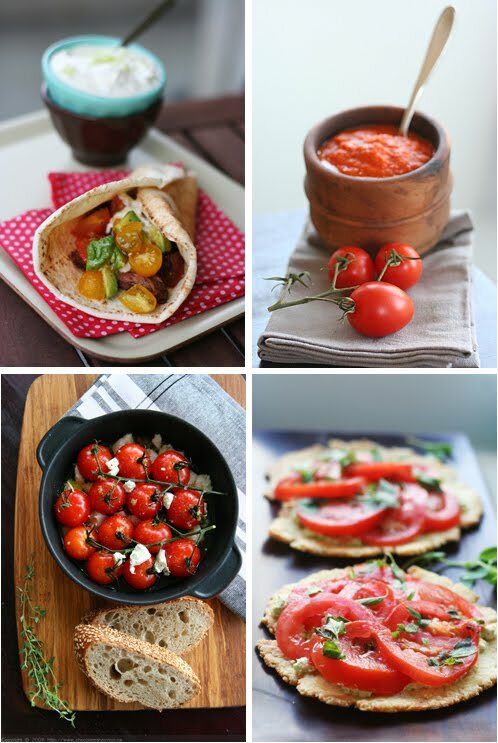 As the full swing of summer is making its way, I thought I would do a little roundup of my favourite tomato recipes to enjoy all summer long! Tomatoes are one of favorite things about summer. Even the ones at the supermarket, which usually taste like cardboard, are sweet and flavorful. The photos are amazing!!!! I love cooking with a tomato base, esp red curry, the pita bread looks divine! Just pop back to say thanks for leaving such a nice comment on my blog. I am your blog follower and always love your photo style. It's looks really delicious. Thanks for sharing this recipe details. There are such beautiful tomatoes at the farmers market these days - thanks for sharing some great recipes to help me use them up! I have enjoyed couple of recipe from tomatoes. Just last week, I have enjoyed sun rise tomatoes with pasta. A sounds of tomato tart with goat cheese cream are really delicious.